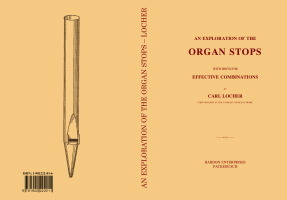 Description: This book describes in a dictionary type format, various organ stops and other contrivances used on an organ; with details of combinations that each stop can be used with. Locher, Johann Carl. Pupil of Johann Rudolf Weber and Adolph Reichel. Organist of the Protestant Church, Bern, 1883; the Nydeck Church, Bern, 1890. b. Bern, Switzerland, Nov. 3rd, 1843; d. there, Nov. 26th, 1915.